Today the wife said let’s go to a slate museum; you can just imagine the children’s faces! She then made it sound even worse when she said it had some sketchy reviews on Trip Advisor but she wanted to make her own mind up and go there regardless! Very reluctantly the boys got dressed this morning and made their way to the car. With such low expectations it had to be better… surely. So off we drove to Inigo Jones near Caernarfon – to find our car the only one in the visitor car park. It’s always slightly worrying when a place is completely deserted. 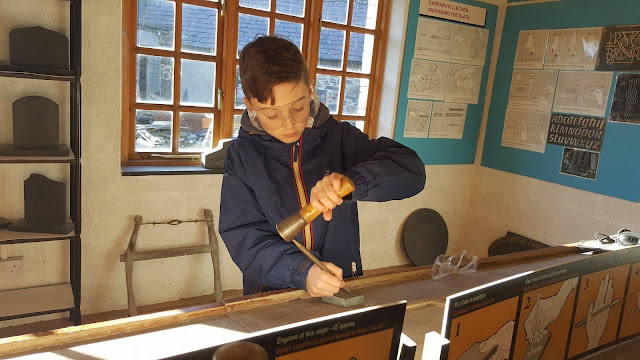 But we ended up having a really nice time and the boys were pleasantly surprised too, they got to have a couple of hands on experiences they weren’t expecting like engraving a piece of slate they could take home afterwards. 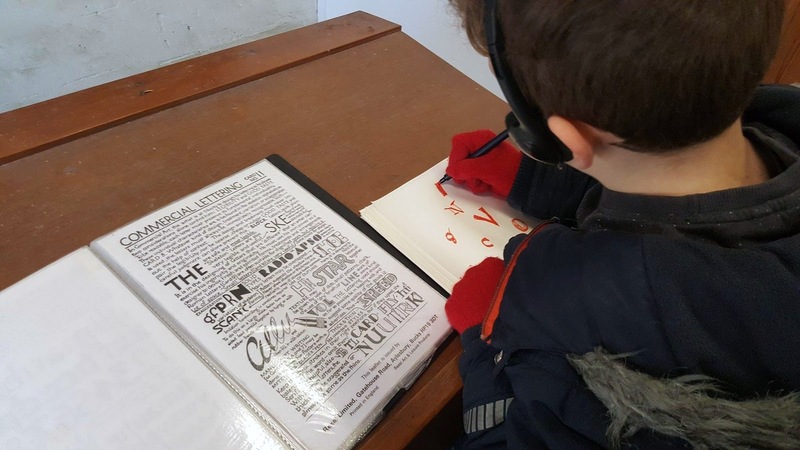 They also liked trying their hand at calligraphy. The workshop tour cost £19 for the four of us and it was an interesting hour of our time. We started off watching a short film about slate before wearing headphones and listening to a self-guided tour. Eldest at 9 got on better than his younger brother with this. My youngest didn’t seem to pause at the correct places and ended up not entirely sure where he was up too. 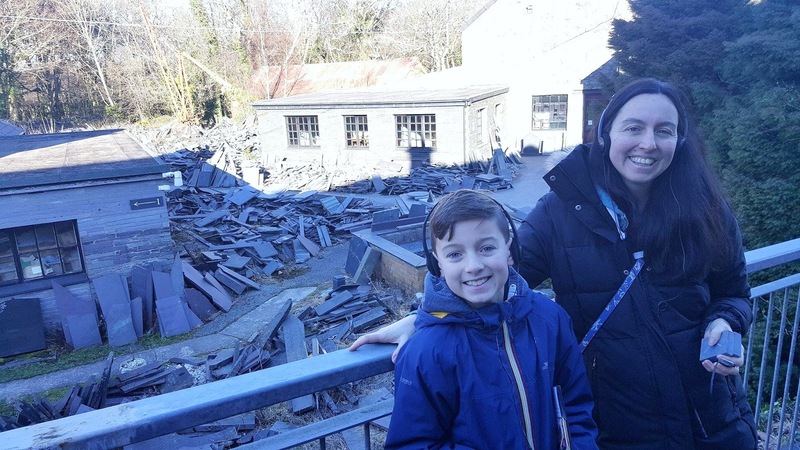 That said he was still in awe of the whole place, he liked that everything was just out for him to see, his hand even made it into a wheelbarrow of slate dust at one point much to his amusement. In terms of health and safety the place is slightly on the risky side with Stanley knives and other random tools everywhere so do keep an eye on your children. It was quite educational I don’t think any of us appreciated before just how much blood; sweat and tears goes into getting slate out of the ground! It looked like a dangerous job involving lots of heavy machinery and afterwards more still getting it sized and finished correctly!!! 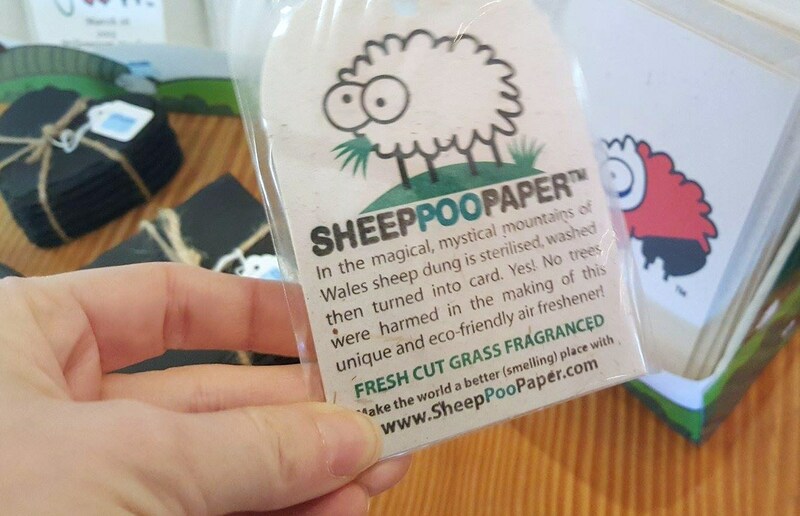 Ewe- sheeps poo - see what I did there! Might give this place a go as long as you don't have to go underground?